My girls are all about flowers. When we walk by the neighborhood garden, my oldest stops to see if any new flowers have bloomed. She is currently doing a gardening unit at school and is going to be a flower girl in a wedding this weekend so her interest has peaked even more recently. Every time we go to Whole Foods, both of my girls want to pick out fresh flowers for our apartment, which I don’t mind because fresh flowers always brighten up the place. We were home one rainy day when I decided we needed “flowers” for lunch to make the dull day a little brighter. We also talked about what my oldest was learning at school and her upcoming role as a flower girl. For the leaves you can also use fresh basil. You can also add Blueberries at the bottom of the “stem” to make it look like “dirt”. Getting my girls to eat vegetables with their meals can be challenging. I recently learned about Peas of Mind, all natural products made with real vegetables. Peas of Mind sprouted from the idea that as kids begin eating solid foods, the tastes and textures they experience will shape their eating habits for a lifetime. Their products are great for health-conscious parents who want to feed their growing kids delicious meals with organic ingredients, but don’t have the time to make them from scratch. Peas of Mind products are found in the frozen food section of Whole Foods, other retailers can be found here. My family received the opportunity to try a Peas of Mind product. My youngest daughter tried the cauliflower veggie wedgies. Veggie Wedgies, which look like french fries, come in three other flavors: broccoli, carrot, cauliflower, and apple. They come frozen and are very east to make. Place them on a baking tray and coat with non-stick spay then bake them for 10 minutes or until they are your desired crispness. I sprinkled them with a little salt and garlic salt Each serving has more than half a serving of your child’s recommended fruit and vegetable intake for a day. My daughter usually doesn’t like cauliflower but she had no problem scarfing these veggie fries down. They make a great “veggie side” for any meal. My oldest didn’t try them because I noticed they are made in a facility that produces nuts and she has food allergies. I left a few to the side for myself and really enjoyed them. I am looking forward to trying other Peas of Mind products with her. Pull-a-parts are made with pieces of our signature veggie dough with broccoli and carrots kneaded into it. Peas of Mind kneads real broccoli and carrots right into the pizza crust. They use pepperoni with no nitrates and nitrites. One pizza contains 1½ servings of veggies. Puffets are available in 5 flavors: Nana’s Banana, Carrot Risotto, Black Bean Polenta, Eat Your Greens and Mama’s Pasta. Disclaimer: All opinions expressed are my own. Information in italics came from the Peas of Mind website. All images unless stated are from Peas of Mind. I received a coupon for a free product for the purpose of this review. Growing up the thought of Brussel Sprouts disgusted me. I wanted nothing to do with the little balls of “salad”. I never gave them a shot until a friend had me over for dinner and served them roasted. I got hooked and am addicted to them. Recently, I came across an image of a Brussel Sprout and egg dish on pinterest that looked amazing and had to try it. The original recipe came from Naturally Ella but I adapted it by halving the sprouts instead of shredding them. I also use yellow onion, add fresh garlic, and recently tried using chipotle olive oil from LeRoux Kitchen for a little added flavor. This is one of my favorite dishes and have made it for several people who LOVED it just as much as I do. It is a delicious meal for breakfast, lunch or dinner. Put all the ingredients in the Beaba and blend, adding more water and seasoning as needed. Last week was a pretty hectic week. We went away for Memorial Day and when I got back I was rushing to get the class gift together for the last day of school and running around getting ready for my friend’s wedding which was Saturday. The girls were staying the weekend with my mom so I also had a lot of grocery shopping to do. I usually just go to Whole Foods daily so I needed to make sure I had enough food for my mom and the girls so she wouldn’t have to go out. It was such a busy week preparing for the weekend and catching up from being away, easy meals were the way to go. I stocked the freezer with Mom Made Foods and made sure to have plenty of pasta, sandwich meat, and anything easy to prepare. The favorite for the girls was the Mom Made Meals Spaghetti and Meatballs. My girls love it so much, Pela had to carry the box through Whole Foods one day and ate it as soon as we got home. The girls have tried the Mom Made Mac & Cheese, Turkey Meatball Bites, Bean Burrito Munchie and Cheese Pizza Munchie and have enjoyed them all. Mom Made Foods are perfect for when you are getting ready to go away and don’t have time to make a meal. Mom Made Meals are quick and delicious-my husband has been known to eat the Spaghetti and Meatball on nights we don’t cook. Click to find Mom Made Foods near you. 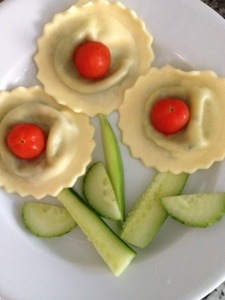 Image from Mom Made Foods. Comes with 4 bite size meatballs. I like serving in our Oogaa bowls to make re-heating easy if the girls don’t finish it all. 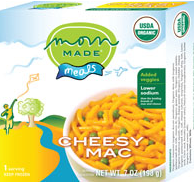 GIVEAWAY: Enter to win 5 coupons to try Mom Made Foods FREE. Giveaway ends on Thursday, June 14 at 12 p.m.
To enter leave a comment with Mom Made GIVEAWAY and a Mom Made Food you would like to try. Comment on my wall by “liking” Tastefully Childish on Facebook (mandatory). Disclaimer: I did not receive compensation for this post. I was given coupons for the purpose of this giveaway and past reviews. All opinions expressed are my own. I have been fortunate to try Enjoy Life foods: cookies, chocolate chips, granola and recently their line of Seed and Fruit Mixes. When you have a child with a food allergy, your entire life and eating habits have to change. I can no longer have anything with NUTS in the house and I spend way too much time at the grocery store reading labels. Until I received, Enjoy Life Seed and Fruit Mixes, I forgot how much I missed snacking on Trail Mix. I never thought about trail mix because I knew it was usually loaded with nuts and it was a NO NO in our house. Thanks to Enjoy Life, I can have that sweet and salty mixture that I love and miss so much. Their Seed and Fruit Mix is a great alternative to Nut Trail Mix and it has become my go-to snack for throughout the day. I had a difficult time getting the girls to eat it because Maddie insisted that seeds were for planting and not for eating. I eventually got them to try it by adding some goldfish to it. Not Nuts! Beach Bash: A yummy medley of sunflower kernels, pumpkin seeds, dried pineapple, apricots and cranberries. My favorite of the two because it goes great in a salad or on it’s own for a fast, filling, and delicious snack. Nutritional and Ingredient Information can be found on Enjoy Life’s website. Not Nuts! Mountain Mambo: Made with sunflower seeds, pumpkin seeds (pepitas), fruit (raisins, apples, and cranberries) and chocolate chips. I enjoyed this one too especially when I got a chocolate chip in my bite. I added it to my greek yogurt and it was surprisingly a good combination. It is also yummy on its own as a quick and easy on-the-go snack. Be careful about where you leave your mix because the chocolate chips will melt and create clusters of seeds. Nutritional and Ingredient information could be found at Enjoy Life’s website. Even if you don’t have an allergy, Enjoy Life products are delicious and are safe to bring to school. Everyone should be able to Enjoy Life and Eat Freely! One lucky reader has the opportunity to win 1 box of Crunchy Cookies, a bag of Granola, and a bag of the Seed and Fruit Mix. Winner will choose flavor. To find out more about the different flavors, see my past reviews: Enjoy Life: Crunchy Cookies, Enjoy Life: Eat Freely (Granola Review) and Recipe using the Double Chocolate Crunch Granola. You can also check out Enjoy Life Recipes for other ways to use Enjoy Life foods. All entries must be posted before Sunday, April 29 at 11:59 pm. A while back I discovered Mom Made Foods at my local Whole Foods. I posted about Mom Made Mac and Cheese back when I started my blog because it was a quick and healthy meal that I didn’t feel guilty about heating up for the girls. About a month after my post my mom ran into the Mom Made Foods team while they were doing a promotional event at her local Whole Foods in Virginia. She found out that Mom Made Foods is based out of Alexandria, Virginia (my hometown) and gave them my card. Heather Stouffer, founder and CEO, reached out and invited me to stop by the office with the girls to meet her and talk more about Mom Made Foods. After our visit, the girls received a box of Mom Made Turkey Meatball Bites for review. About Mom Made Turkey Bites (Information from Mom Made Foods): Custom-sized meatballs are made with antibiotic-free turkey, and are significantly lower sodium than other ready-to-eat meat products. Mom Made Turkey Meatball Bites are made from simple ingredients, and taste like homemade. Enjoy them on pasta, with cheese on a roll, or on their own as a fun main dish for dinner! Ingredients: Turley raised without antibiotics, bread crumbs (bleached wheat flour, yeast, sugar, and salt), Nonfat dry milk, celery, Whole eggs, Onions, Salt, Oregano, and Spices. CONTAINS: Wheat, Milk and Eggs. The girls loved the meatballs so much my mom and I decided to try them. They are bursting with great flavor in every bite. You can definitely taste the Oregano in them. They are great to add to pasta (Maddie’s favorite), or to dip in ketchup for a snack. The meatballs where also the perfect size for sandwiches. I tried two different types of sandwiches with the girls: a silly turkey meatball sandwich and a Thanksgiving craving sandwich. The girls weren’t really into the bread with the sandwiches but they devoured the meatballs. Unfortunately, my Whole Foods does not have the meatballs in stock but when I see them I will certainly keep a stock in my fridge. Maddie says: I LOVE meatballs. Mom Made Foods are a staple in our freezer for the hair-raising days that I have no energy to cook, when I am rushing out the door or have a sitter and need something healthy and easy to prepare. 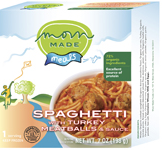 You can find Mom Made Foods in the freezer aisles at Whole Foods, A&P, Pathmark, Waldbaums, Mrs Greens, Fairway, and Duane Reade (as of mid-April). To find out more about Mom Made Foods and other products please visit their website, their facebook page or follow @MomMadeFoods on Twitter. Disclaimer: I did not receive compensation for this post. I received the Mom Made Turkey Bites for the purpose of this review. All opinions expressed are my own. One of my resolutions for 2012, is to eat healthier. After I had Pela, I went to a nutritionist to help me lose the baby weight and to help me eat healthier. One thing she suggested was to go Gluten Free. I felt so good but once I hit my goal weight, I quickly fell of the band wagon. This year I want to try to get back on track and eat healthier. When I was visiting my mom she told me about Quinoa pasta and that she usually eats it with Veggies. It is delicious and healthy. In my opinion, a much better alternative to pasta whether you are gluten free or not. 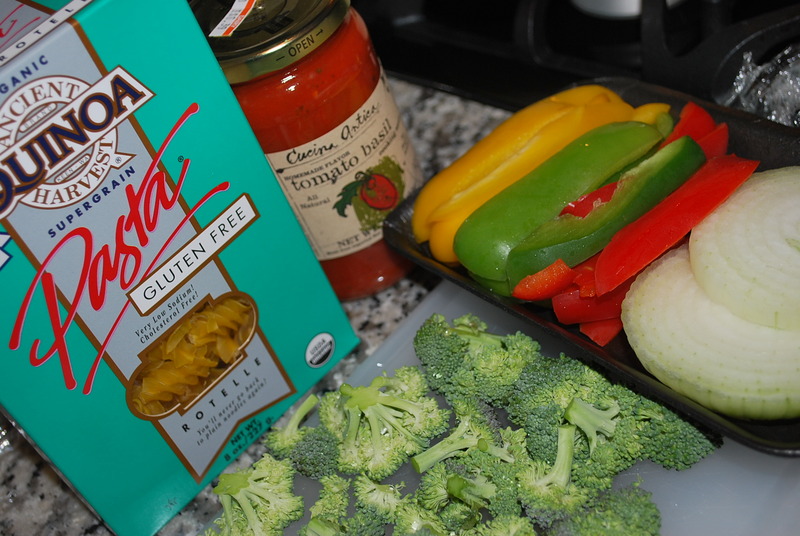 Lately, we have made Quinoa Pasta with sauteed veggies and tomato sauce. Yummy. The girls even like it. They usually pick out the veggies, so if you want to hide them, once they are cooked, put them in a food processor or Baeba babycook before mixing them into the sauce. Heat oil. Sautee veggies until cooked though, on high heat. Meanwhile, follow cooking directions for Ancient Harvest Quinoa Rotelle Pasta. Heat sauce, simmer on low. 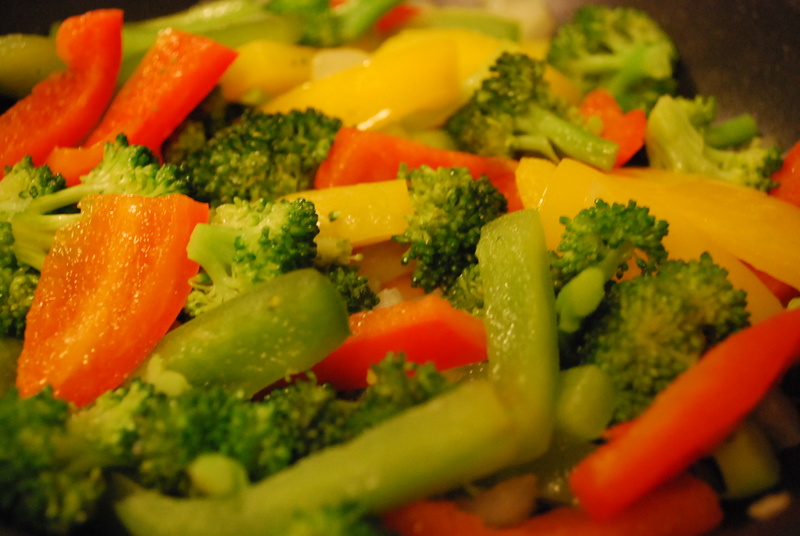 If you are going to use the food processor or Baeba babycook, blend veggies before adding to sauce. If not, mix sauteed veggies into the sauce. Put desired amount of pasta into a bowl, with sauce over it. Add Parmesan cheese. *Note: I forgot to take a picture of the finished product but will post it on FB next time I make it. The past couple days we have been busy with family in town and I am going to a MomTrends event tonight I wanted a quick and easy dinner. While I was at Whole Foods I came across Mom Made Meals. We got the cheesy Mac and Cheese. I saw the peas in it and didn’t feel so bad. When I read the ingredients I discovered that there are sweet potatoes and butternut squash in the ingredients as well. I grabbed a couple of boxes for when it gets a little hectic over the Holidays and we need a quick and easy lunch or dinner. It would be a great side to your left over turkey (if you are still have any) or with chicken tenders. The girls loved every bite. I even tried it and really liked it. I went to the Mom Made Meals website and saw the variety of meals, munchies’, and bites that I can’t wait to get for the girls. Check out their website to see where you can Mom Made Meals in your neighborhood or to order them online. iAll mages from Mom Made Meals.